The volume of new malware specifically targeting mobile devices is growing at an exponential rate. New malware attacks are also becoming increasingly sophisticated – as cybercriminals recognise the value of the information that they can steal from mobile devices. At the same time, most corporations are recognising the productivity benefits that can be gained by giving their mobile workforce ‘anytime, anywhere’ access to more of the business’s corporate systems and data. 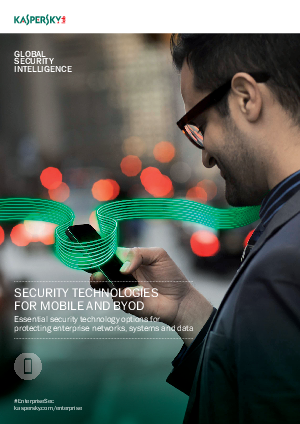 Coupled with businesses embracing Bring Your OwnDevice (BYOD) initiatives the security risks are significantly increased, so the need for effective mobile security technologies is greater than ever. Download this paper to find out more and how you can protect the business from these threats.